Stop posting guitar demos filmed with a smartphone and how to do better! I am regularly dismayed by the poor quality of videos of guitarists who make a demo and are posted, for example, at the end of the guitar shows where luthiers and amp manufacturers post videos made with a smartphone with a mediocre sound which is not showcasing properly the product presented (guitar, amp or pedal). What is amazing is that these people who post videos, whether luthier, manufacturer of amplifiers or pedals, are for the vast majority of craftsmanship to know very high level. And yet, they are content to post these awful videos. Imagine a painter who would distribute black & white photocopies to promote one of his painting. Unthinkable! And yet that's exactly what's happening with these videos. So here is an article to explain how to solve this problem without becoming a sound engineer and without spending a fortune. The problem: the poor audio quality of videos posted of a guitarist testing a guitar, an amp or pedal. The culprits: the guitarists themselves, the luthiers and the craftsmen manufacturers of amps and pedals. The source of the problem: a recent smartphone usually has excellent videos but records sounds poorly because it captures way too much the atmosphere of the room where you are. If you film a person who is close enough, the result is generally correct, if you shoot a guitarist in a room, it's a disaster. The reason for the problem: to record a good signal, the microphone must be close to the source so when you shoot someone from 2 or 3 meters, it's far too far from the source to work properly. See in particular the demos made during guitar shows. In 9 out of 10 cases, it is a calamity. This concerns videos filmed in a test room or on stage where it is even worse since the camera is even further from the source. Ditto for the videos shot on a booth with all the noises of the show around: awful! In order not to offend anyone, I will not include here specific videos because the purpose of this article is not to finger point someone in particular but to show how to do better. You will have no problem finding those videos on YouTube and Facebook. The solution: record the sound properly! Using both methods: a Koch LB-120 II loadbox and two SM57 and SM58 microphones. Note that it is possible to combine the two methods to have more possibilities during editing and mixing. Digital recorders usually have 2 or 4 tracks (like the Tascam DR-70D pictured below), so you can potentially have both options at the same time. A digital recorder: the Tascam DR-70D, which can record up to 4 tracks. Requires a quiet room without noise to give good results. Note that, as for the electric guitar, it is possible to combine the two methods to have more possibilities when mixing. To get a video with a good sound, you have to go through the video editing step. That is, a computer will be needed to put the recorded video and sound together. All recent computers offer basic video editing software that allows that. On MacOS, iMovie works very well and is included on all Apple machines. Note that the synchronization between video and sound is sometimes done by hand by aligning the waveforms. In some software cases (like Final Cut Pro) this synchronization is automatic. 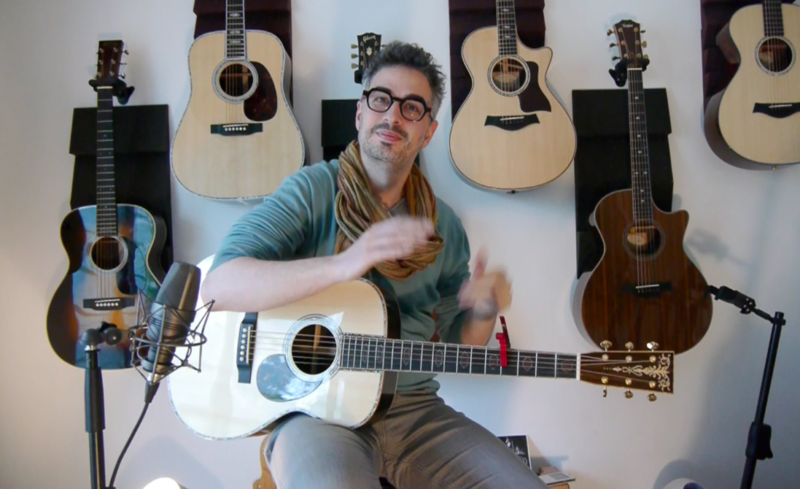 In the two videos below you will see and hear the musician Shaï Sebbag testing a Taylor Academy 12th acoustic guitar with the two methods outlined above. 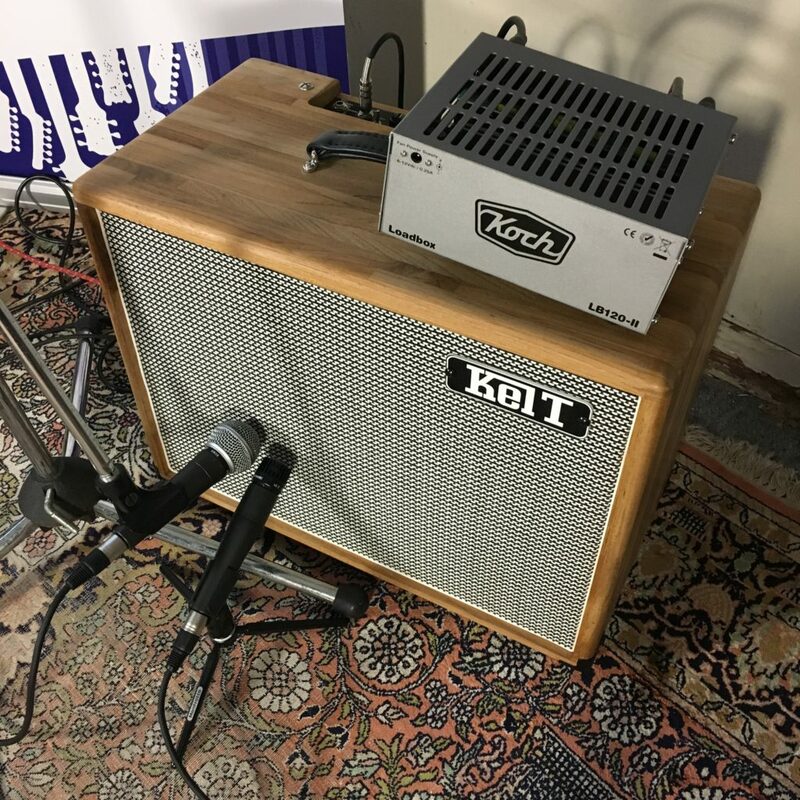 To listen to the differences in sound between the sound taken with a loadbox or a microphone in front of the amp, I refer you to this article that gives examples between the SM57 and the SM58 (which are also almost the same microphones) and the Koch LB-120 II loadbox. What is described above is within the reach of anyone. Especially if you are a luthier, manufacturer of amps or pedals, you know better than anyone how your equipment sounds. So no reason not to do it justice. A luthier guitar usually costs between € 2,000 and much more, an amp costs easily in the € 1,500 and more, make a few hundred Euros of investment to produce beautiful video is a must. Stop uploading these calamitous videos! with a cool unexpensive tool from IK Multimedia to get awesome sound. Until the next blog post or interview, keep on playing the guitar!